CDL Testing pricing and services. "Renting Trucks and Buses for CDL Testing"
We will allow you time to get familiar with the truck the day before your test. Price includes time to get familiar with the truck before you test. All taxes and fueling fees are included in the price. We will allow you time to get fimilar with the truck the day before your test. All fees and charges are solely for the rental of the vehicle. A+ CDL Truck Rental is not a driver training school, we can not provide training. we deem unsafe or may pose a danger in any manner to our employees or others. of Public Safety at 7:00 a.m.
result in being charged full rental fee. Price includes time to get familiar with the truck before you test. All taxes and fueling fees are included in the price. rental will result being charged full rental fee. 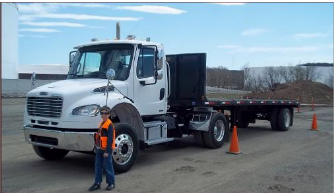 A+ CDL Truck Rental is not a driver training school, we do not provide training. The driver should have already obtain the skills necessary for safe operation of the truck prior to scheduling testing. The renter will be asked to demonstrate they can safely operate the vehicle. A+ CDL Truck Rental is not affiliated with the Department of Public Safety and we reserve the right to refuse rental to any driver we deem unsafe or may pose a danger in any manner to ouremployees or others. with Department of Public Safety at 7:00 a.m.